With the recent advent in genome editing using engineered nucleases such as CRISPR/Cas9 systems, it has become clear that many diseases can be treated or cured with high efficacy and specificity (1, 2). While for treating diseases such as sickle cell disease, ex vivo genome editing can be performed efficiently by delivering the editing machinery into cells (often stem cells) outside the body, for treating other diseases such as spinal muscular atrophy, in vivo genome editing strategies are necessary since the target cells cannot be taken out from the body (3). However, with current non-viral delivery systems including nanoparticles, achieving both high efficiency and tissue specificity is a major challenge when the editing machinery is delivered systemically (4). On the other hand, local injection is invasive and may not give a desirable tissue distribution. Viral vector based in vivo delivery of CRISPR/Cas9, while efficient, may suffer from uncontrollable expression of the editing machinery, causing genotoxicity and other detrimental effects. Even when injected locally, viral vectors such as AAV (adeno-associated viral vector) could leak to other tissues or organs (5), leading to unintended ‘off-target’ editing. It is thus very desirable to have an efficient in vivo delivery system for CRISPR/Cas9 that could edit specific regions of a tissue/organ with spatial and temporal control. Figure 1: A schematic illustration of the MNP-BV system for in vivo delivery of CRISPR/Cas9 with magnetic spatial control of gene editing in a specific region of the target tissue. 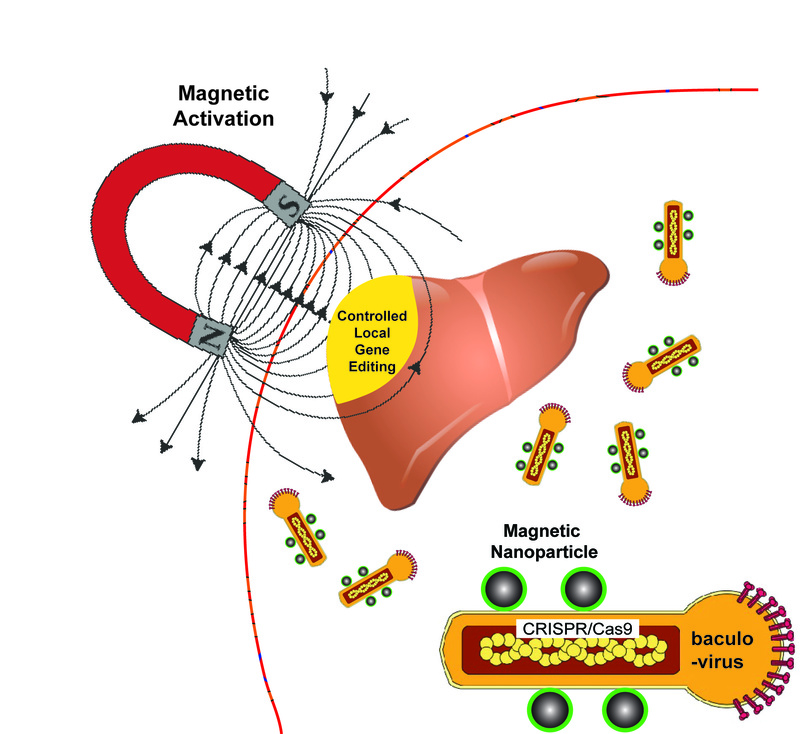 To address this unmet need, we have developed a nanoparticle-viral-vector complex for in vivo delivery of CRISPR/Cas9 with spatial control of gene editing by an applied magnetic field. The viral vector we used is baculoviral vector (BV), a rod-shaped DNA virus that infects insects (Figure 1). BV has a large packing capacity (> 38 kb) and can transduce gene expression in mammalian cells without being integrated into the host genome (6). However, during systemic delivery, BV is inactivated in vivo by the serum complement system (7). We discovered that, when magnetic nanoparticles (MNPs) are attached to BV to form an MNP-BV complex, its in vivo transduction could be activated locally with an applied magnetic field (Figure 1). We showed that the MNP-BV complex provides efficient magnetic-field-driven BV transduction and transgene expression in different organs, and spatially-controlled genome editing in different tissues such as the liver and the tumor. Effective transduction of the MNP-BV complex in vivo, thus the nuclease activity of the CRISPR/Cas9 system packaged in MNP-BV, is ‘trigged’ by the applied magnetic field, which serves as an activator of transgene expression and genome editing in target tissues/organ on-demand (Figure 1). We also provide insight into the mechanism of binding between BV and magnetic nanoparticles, and how the MNP-BV system prevents complement inactivation of BV. The MNP-BV based in vivo delivery system takes advantage of the ability of nanomagnets to overcome BV inactivation locally, thus enabling spatial control of in vivo gene delivery and genome editing. Owing to the large DNA loading capacity of BV, the MNP-BV based delivery system has the potential to facilitate multiplexed and controlled genome editing in vivo. Clearly, BV activation and gene editing efficiency in the target tissue depend on the strength and spatial distribution of the magnetic field, as well as the distribution of MNP-BV. Although the block magnets used in our in vitro and in vivo experiments could generate a strong magnetic field (1.48 Tesla), the resulting magnetic force applied to the MNP-BV complex weakens with distance, thus limiting the size of the tissue that has a high level of gene editing. With a large magnetic device consisting of a set of coils optimally positioned, it is possible to apply a strong magnetic field gradient anywhere in the body, thus overcoming this limitation. Our paper: Zhu et al. , Spatial control of in vivo CRISPR/Cas9 genome editing via nanomagnets. Nature Biomedical Engineering (2018). 1. Cox, D.B., Platt, R.J. & Zhang, F. Therapeutic genome editing: prospects and challenges. Nature medicine 21, 121-131 (2015). 2. Dever, D.P. et al. CRISPR/Cas9 β-globin gene targeting in human haematopoietic stem cells. Nature 539, 384-389 (2016). 3. Nelson, C.E. et al. In vivo genome editing improves muscle function in a mouse model of Duchenne muscular dystrophy. Science 351, 403-407 (2016). 4. Wang, H.X. et al. CRISPR/Cas9-Based Genome Editing for Disease Modeling and Therapy: Challenges and Opportunities for Nonviral Delivery. Chem Rev. 117, 9874-9906 (2017). 5. Wang, Y. et al. Systemic dissemination of viral vectors during intratumoral injection. Molecular cancer therapeutics 2, 1233-1242 (2003). 6. Mansouri, M. et al. Highly efficient baculovirus-mediated multigene delivery in primary cells. Nature communications 7, 11529 (2016). 7. Chen, C.Y., Lin, C.Y., Chen, G.Y. & Hu, Y.C. Baculovirus as a gene delivery vector: recent understandings of molecular alterations in transduced cells and latest applications. Biotechnology advances 29, 618-631 (2011).